If you love soft colours and nature-inspired motifs combined with repurposed furniture, vintage decor is the perfect one for you. Vintage is one of the easiest style to achieve in your home, because you could use existing pieces of furniture, accessories or details to incorporate into the decor. Furthermore, there are so many different ideas you could include into your home decoration, and turn it into a true shabby chic place. Vintage décor is all about experimenting and improvisation. A distressed coffee table or desk will mix up perfectly in the living room nook with a chipped paint armoire and the old wooden armchair. Old chairs can easily be turned into a brand new piece of furniture, if you only paint them in some bright colour such as orange, red or sky blue. Put them together with an eggshell painted wooden table, and you will have the perfect vintage furniture for your dining room. Wooden chests and trunks are the best vintage piece you could have in your home. What is even better is that they can be used in numerous ways. 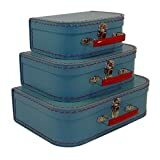 Use them as a storage furniture item or turn it into a nightstand, an office desk or a coffee table. 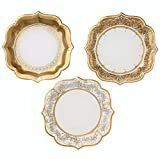 These antique pieces will give the additional vintage touch to your home, and look amazing no matter where you put them. Collections of complementary colours could be perfectly coordinated, in order to provide the best vintage look of a room. Bright yellow walls, in combination with orange wood cabinet would provide the ultimate vintage touch to the space. Classic colours, such as blue and white are always welcome in vintage style. Bright colours will really pop if they are incorporated with a neutral background. A bright coloured glassware and pottery will shine perfectly if you put it against a pastel shades of green, blue and pink. Just because handkerchiefs are not as practical and popular as they once were, it does not mean you cannot use those unique fabrics for something creative. In order to get a fabulous vintage airy curtain, sew a couple of handkerchiefs together, add rings along the top, and you are all done. The perfect curtain is ready for the window decoration. For the ultimate vintage and unique bedside table, use a stack of vintage suitcases. All you have to do is place them on a low-cost crate or stand to add a little extra height. Nothing says elegance, the way a chandelier does. 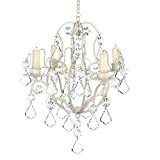 Give an old chandelier a vintage makeover by adding a couple of trademarks to it and make your lighting chic. 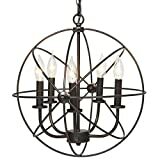 Hang it over the dining room table for some extra lighting. You can never get enough light in a room, so led wall lights can serve great as an additional brightness. If you are crafty in repurposing items, then you will love the idea of making mason jars, milk bottles and other glass containers into vases. Furthermore, you can keep paper clips, rubber bands, pens or pencils inside them. Weathered planks can be the perfect vintage touch to the living room. Place four of them on the wall and use them to display your vintage knickknacks. Everything from old figurines, collectables, and picture frames or anything you wish everyone to see will look fabulous on these old-fashioned shelves. With vintage, it is all about repurposing. Therefore, try to a flowerpot out of an enamel casserole dish you no longer use. 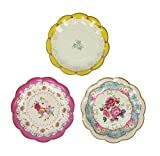 Old vintage plates will look adorable on an unused wall to add a little bit of charm to it. When you feel the need for changing your home décor, go for the vintage design and make your home unique. Vintage style is timeless and easiest to modify, considering there is always some old-fashion piece of furniture in your home. Incorporate some of these ideas into your home décor and achieve the perfect shabby chic design.